Show Dad how much you appreciate him with a Father’s Day overnight getaway to the Kitsap Peninsula. With world-class golf courses, amazing craft beverages and miles and miles of family-friendly trails and beaches, there’s something here to make every Dad smile. Get away from the big-city crowds, relax and enjoy stress-free family time on the Natural Side of Puget Sound. Whatever you choose to do, we can guarantee the scenery will be spectacular. Golf – The Kitsap Peninsula boasts some of the top public courses in the state, including White Horse Golf Club, Gold Mountain Golf Club, Trophy Lake Golf & Casting Club and McCormick Woods Golf Club. Natural lakes, mountain views, wildlife and serene woodland settings complement the manicured greens and holes geared toward all levels. Dining options include the outdoor patio at Cedar Ridge Grill overlooking the 18th hole at White Horse. Find out more about golfing on the Kitsap Peninsula at the VKP website. Craft beverages – There are more than a dozen microbreweries on the Kitsap Peninsula, as well as award-winning distillers and wineries. So, if an adult beverage sounds tempting, we’ve got you covered. There’s something for every taste, including Sound Brewery’s Belgian-style beers and Silver City Brewery’s German-style lagers. Read this blog post to plan a tasting tour and this one to learn about the Kitsap Peninsula’s three impressive distilleries. We also have a number of wineries that are well worth visiting, including Olalla Vineyard & Winery and Bainbridge Vineyards. More at the VKP website. 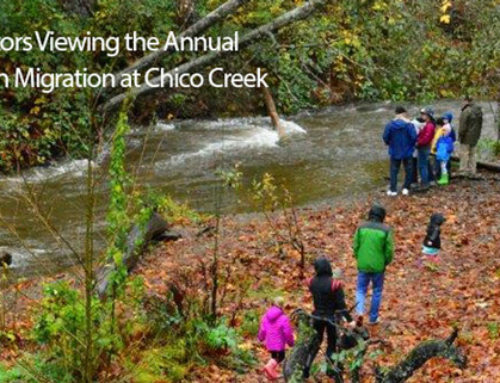 Clear Creek Trail – This trail is close to everything – hotels, shopping, restaurants and breweries – but feels like it’s a world away. It runs the length of Silverdale and connects three amazing parks. The hiking-biking paths are wide and perfect for strollers or wagons, and there are plenty of places to picnic along the way. 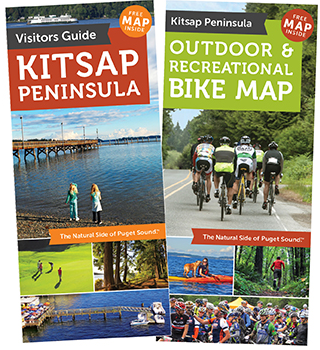 Read our blog for an insider’s guide to trail highlights and click here for more Kitsap Peninsula public parks and trails. CB’s Nuts – This tasting room in Kingston might just become dad’s happy place. He can sit in a section of the original Seattle Mariners dugout from the old Kingdome, have a beer and sample peanuts fresh out of an antique barrel roaster. African peanut stew and sweet treats are available daily and you can take home a refillable bucket of roasted peanuts or a jar of CB’s famous one-ingredient peanut butter. The tasting room, 6013 NE State Highway 104, is open 10 a.m. to 5 p.m. Sundays through Thursdays, and 10 a.m. to 6 p.m. Saturdays and Sundays. Friends of the Manchester Library Annual Father’s Day Salmon Bake, 11:30 a.m. to 3:30 p.m. Sunday, June 18, 8067 E. Main St., Port Orchard – Great meal in a gorgeous setting that includes public beach access and views of Seattle and Mt. Rainier. Dinner includes salmon, cole slaw, baked beans, garlic bread, drink and a cookie for $15 per adult, $10 for children ages 6-11, and $5 for children younger than 6. Poulsbo Midsommarfest, June 16-17, Muriel Iverson Williams Waterfront Park, 18890 Anderson Parkway, Poulsbo – Celebrate the summer solstice (a few days early) with the Vikings of Poulsbo a/k/a Little Norway. There will be a procession with torches through town beginning at 7 p.m. Friday followed by a bonfire. The raising of the Maistang (midsommar pole) and traditional Norwegian dancing starts at noon Saturday. Between festivities, enjoy waterfront dining at The Loft or relax with a local beer at Slippery Pig Brewery or Valholl Brewing. Wings of Freedom Tour, June 19-21, Bremerton National Airport – Tour the B-17, B-24 and B-25 bombers that won WWII in this living history exhibit. No reservations are needed for walk-through tours noon to 5 p.m. June 19, 9 a.m. to 5 p.m. June 20, 9 a.m. to noon June 21. Admission is $15 for adults and $5 for children ages 12 and younger. If money is no object, you can schedule a 30-minute flight on one of the bombers for $400-$450. Lodging suggestions: From waterfront suites to budget- and family-friendly options, the Kitsap Peninsula has a wide range of lodging choices. Here are a couple with pools for family fun – Flagship Inn, Quality Inn, Silverdale Beach Hotel, Oxford Suites, Poulsbo Inn & Suites, GuestHouse Inn & Suites and Days Inn. For more ideas, go to the VKP website.